collections, beginning with AirAsia Malaysia (carried code AK), AirAsia Thailand (FD), AirAsia Indonesia (QZ), AirAsia X Malaysia (D7), AirAsia X Thailand (XJ) and AirAsia X Indonesia (XT) flights from now until the end of the month, with more airlines in AirAsia Group to follow. AirAsia will match the total public collection, which will be announced in January 2019. 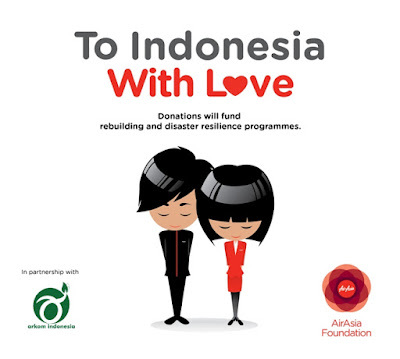 AirAsia Group CEO Tan Sri Tony Fernandes said, “It’s been an incredibly tough year for Indonesia, which has been beset by one deadly disaster after a nother. Our hearts go out to all those who have suffered unimaginable losses as a result. Please visit us on Facebook (facebook.com/AirAsia) and Twitter (twitter.com/AirAsia) to find out more about our relief efforts and the #ToIDwithLove campaign.